Many Interior Designers specialize in the luxurious world of Yachts, and here at Royal American Carpets, we are fully equipped to produce luxurious products that include both custom yacht area rugs and custom yacht carpets. We work with several types of interior designers, ranging from hotel design, country clubs, restaurants, the corporate environment, and more. But when we team up with owners or designers in the yachting industry, our capabilities are utilized in more ways than we can ever imagine ourselves. Royal American offers custom luxury carpets using machine construction, or hand-made construction. Determining which construction to use depends on the total square footage and the desired finished pattern. Most of our custom yacht area rugs are produced by hand. By hand allows us to create and manufacture custom products with an unlimited range of design possibilities, and zero color limitations. Not to mention, no limitations to the size and width. Machine-made products will always have their limitation on width, which can create undesired seams in a room, or design scale constraints. With our hand-tufted construction, we can produce custom lengths and widths to fit any Yacht setting, bedroom, lounge, etc. Whether our clients desire loose-laid area rugs, or wall-to-wall carpet, our design and production staff will design, sample, and create a unique finished product to complete satisfaction. As for the yarn fibers we offer, we can produce custom luxurious yacht carpets with wool, silk, bamboo silk, viscose, nylon, solution dyed nylon, and acrylic. When working with any of these yarn selections, we can produce luxury carpets with a cut pile texture, a loop pile texture, or a combination. As mentioned above, we have basically zero limitations when working with products constructed by hand. Most Yacht owners and Interior Designers love to go the custom route, because it adds an original element for the end-user. Examples include company names, the name of the Yacht, and most importantly, adding elements of other designs that already exist throughout the vessel. It can be color schemes, design direction, or the simply feel. We can accommodate and assist with themes that range from existing traditional concepts, or modern compositions. The design staff of Royal American Carpets welcomes any and all Yacht Design requests to create any design and color combination. 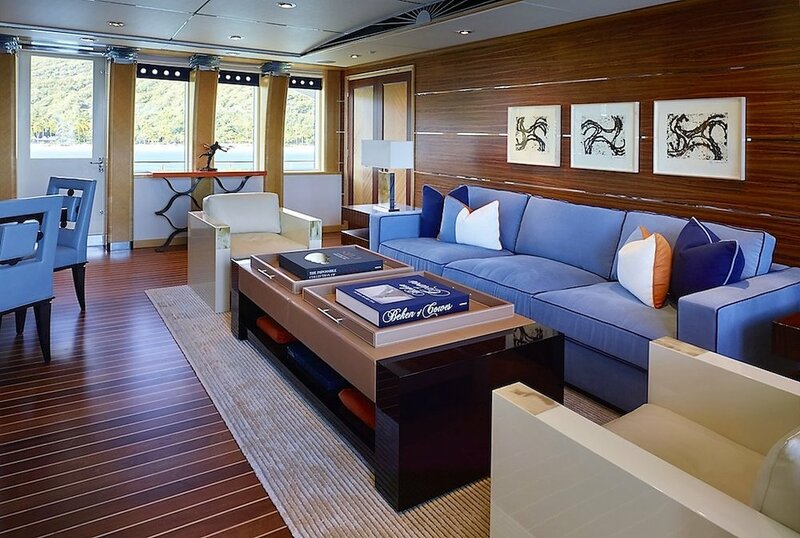 With a virtually limitless array of pattern and color options, Royal American Carpets help can transform any Yacht Setting into something truly extraordinary. Please contact us any time with questions, requests for quotes, or inspirational concepts.